In an earlier article, we addressed the costs and the risks of a range of electrotherapy devices for musculoskeletal pain relief – specifically how to weigh the options between an implanted, percutaneous or surface stimulation device. Does the FDA consider this device to be effective? All electrical muscle stimulators are considered medical devices and need to be cleared by the FDA before they can be marketed in the US. But does this mean that every device is effective? The FDA is guarded on this matter. While the FDA openly questions claims being made for devices sold directly to the public, it has approved (via the 510k process) many units available by prescription for treating specific conditions such as muscle re-education, relaxation of muscle spasms, prevention of muscle atrophy, and for treating other medical conditions which usually result from a serious injury. Every 510k-approved device is cleared for specific indications. Therefore, the best way to learn whether the FDA considers the device to be effective at meeting your needs is to read the product’s Indications for Use. A quality manufacturer will list the approved indications, along with any contraindications, in its Instructions for Use shipped with every product. How many conditions does the device treat? For patients concerned about device effectiveness, another key is to consider the list of indications – that is, the conditions or reasons for using the device. Low-level devices available without a prescription typically have a brief or non-existent list of indications. How will treatments help me? Additional factors to consider are how long the treatments take and how long the benefits last, as well as what evidence is available about patient results. Here, too, not all devices are made the same. Many low-level devices on the market today offer only a single mode (or modality) that delivers a low-frequency current to relieve pain. As a result, patients may be required to wear these devices many hours a day for pain relief – and only receive benefit when the device is actually on the body. More advanced units, such as the RS-4i Plus, are designed to both treat pain and improve muscle function in a single treatment. These dual-modality devices deliver high-frequency interferential current that penetrates deep into tissue for pain relief, and then also deliver muscle stimulation to address the underlying muscle condition. Daily treatment times are generally 20-35 minutes, and pain relief can last 4-8 hours or more. This all sounds great, but you may be wondering – is this treatment going to help my pain? This is where company-published results, clinical evidence and consumer reviews come into play. In fact, RS Medical has compiled impressive statistics from over 7,300 patient surveys conducted over the past 3 years. 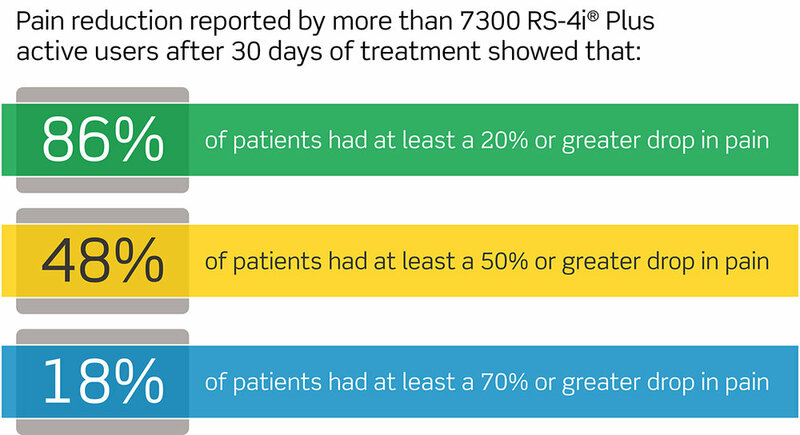 A full 86% of patients report at least a 20% reduction in pain after 30 days. For almost half, there’s a 50% drop in pain, and a lucky 18% experienced a 70% or greater drop in pain. What is the reliability of the company that makes the device? Is it accredited by the ACHC and AdvaMed? How long has it been in business? Are company employees available to answer questions over the phone, via online chat or in-person at a clinic? Does the company offer support for its product? Is there a warranty? While some companies charge extra for a warranty, many medical devices come with no warranty at all – meaning the patient or insurance company is stuck with the bill when a device fails. Quality devices will include a warranty for defect in materials and workmanship. What’s the cost of ongoing use and maintenance? Consumable items like electrodes (the pads you put on your skin), batteries (rechargeable or non-rechargeable) and other accessories can all impact the total cost of ownership. These are important details to know before making a final choice. Will insurance pay for it? Cost is always a factor, and patients should understand what benefits they have before making a purchase. A company that cares about its reputation (and not just making quick sales) will have answers for most or all of these questions right on its website. For instance, if you wanted to learn more about RS Medical, our website shows that we’ve been in business since 1990, have helped over 1.5 million patients and offer a 1-year warranty on our electrotherapy devices. Wading through your options for an electrotherapy device that helps manage musculoskeletal pain might seem daunting, but it doesn’t have to be. There is an abundance of options, and now you’re better informed about how to assess which will be most effective. While all devices marketed in the US are cleared by the FDA, the agency tends to favor those requiring prescriptions. Does your preferred device require one? Make sure to review the list of indications for the device you’re considering. Does it treat the condition(s) affecting you? Evaluate whether the device you want is single-mode or dual-mode. Is it important for you to have both? Have you reviewed details about the company, its reputation and its support practices? Are you going to be satisfied once you make the purchase? What is the cost of ongoing use and maintenance? Do these costs seem reasonable? Have you had experience with electrotherapy or muscle stimulation devices? If so, what questions did you need addressed before making a final decision? Blog: When is a Spinal Cord Implant the Right Choice? This blog provides general information and discussion about medicine, health and related subjects. The words and other content provided in this blog, and in any linked materials, are not intended and should not be construed as medical advice. If the reader or any other person has a medical concern, he or she should consult with an appropriately-licensed physician or other healthcare professional.